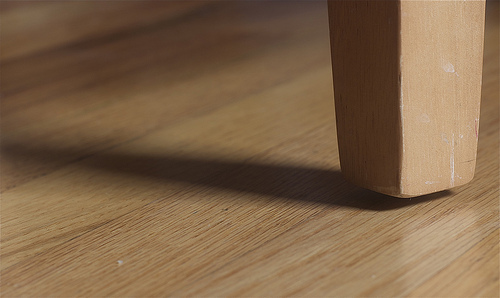 Photo of a hardwood floor by koocbor/Flickr. It’s important to consider floating floor pros and cons before installing new flooring. Since floating floors are designed to last for an extended period of time, you want to make the right choice for a given application. This engineered flooring product, made with a variety of wood species, is popular because it’s easy to install and less expensive than a traditional hardwood floor. However, it comes with some distinct disadvantages that you may want to weigh before taking the plunge. One of the most obvious advantages of a floating floor, which is installed by connecting segments of flooring together so they “float” over a subfloor or existing flooring surface, is that it can be a cost-effective way to install an attractive floor and quickly update a space. A huge range of species and patterns is available, and because this flooring can be installed over a variety of substrates, it’s highly flexible. A floating floor is also easy for people to install as a DIY project, whether they choose a click-lock or a tongue-and-groove version. People with basic do-it-yourself skills can typically install a floating floor in a simple room successfully, or they can hire a handyperson to help with the installation. Furthermore, the installation tends to be less expensive and it’s eco-friendly to boot, because it uses less wood. Some companies specifically seek out certified eco-friendly components including recycled materials as well. When comparing floating floors to glue-down floors, another type of engineered flooring that is also very popular, there are some distinct differences to consider. These floors are easier both to install and to remove than glue-down floors, and they’re also simpler to repair in the event of a problem. In addition, they’re quieter for neighbors, thanks to the insulation provided via an underlayment barrier and the air cushion between the floating floor and the substrate. Floating floors can be noisier in a residence, though, because they tend to clack and echo. While walking on floating floors, people may notice some flexibility and give. This is normal because of the air cushion, and can actually make the floor more comfortable for people with leg and back problems. However, it also represents a serious con, because that same flexibility contributes to faster floor wear. In environments where the temperature shifts frequently or moisture levels are high, floating flooring is not the best choice because it can develop warping, pitting, and mold. Another floating floor disadvantage is the fact that this flooring cannot be sanded. It is designed with a sealed finish. Once the flooring starts to break down or show signs of wear (as for example where a rolling chair rumbles across it), it cannot be refinished; it needs to be replaced. Furthermore, the flooring requires a special moisture barrier underlayment to protect it from humidity, which can sometimes add to the cost of installation; when you’re pricing out floating flooring, remember to include the cost of the moisture barrier. While evaluating floating floor pros and cons, you should also remember that while this flooring is famously easy for do-it-yourselfers to work with, that isn’t always the case. If a room has a complicated footprint, isn’t squared off, or has strange dimensions, installing flooring can quickly turn into a nightmare. You may waste considerable flooring before realizing what’s going on. That's why it's a good idea to consult a flooring expert before you charge ahead -- to see if there are any hidden problems with a room where you intend to install floating flooring.